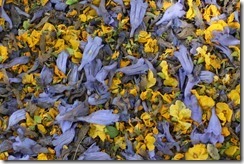 Day 100: How Did That Happen? Day 100. Its really hard to believe we’ve been away for over 3 months (out of the house for more than 4 months). 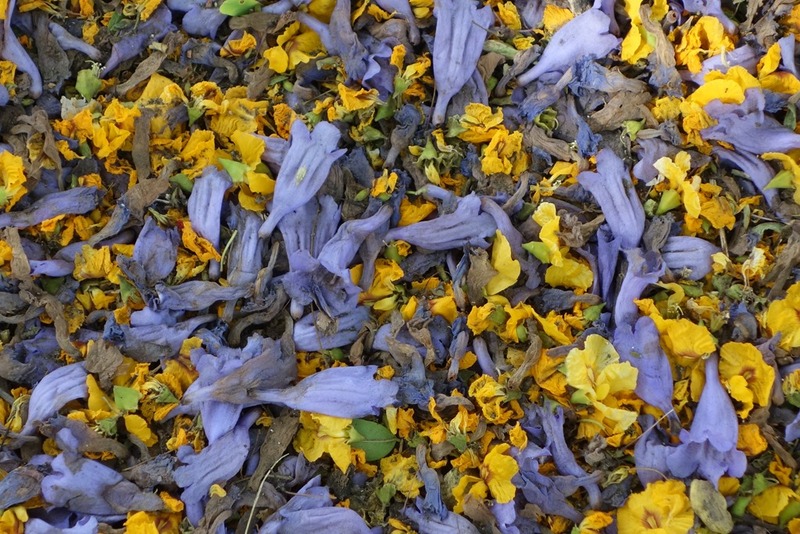 Equally hard to get head around the fact that we only have another couple of weeks in South America (i.e. the part of the trip where we had a fairly clear set of things to do!). The time has just flown by. We miss our family and friends but otherwise very little of the UK (the last season of Dr Who is in my top 3 list of things I miss). We haven’t felt homesick at all really – though Skype, email and the blog have helped to keep us in touch with people at home. 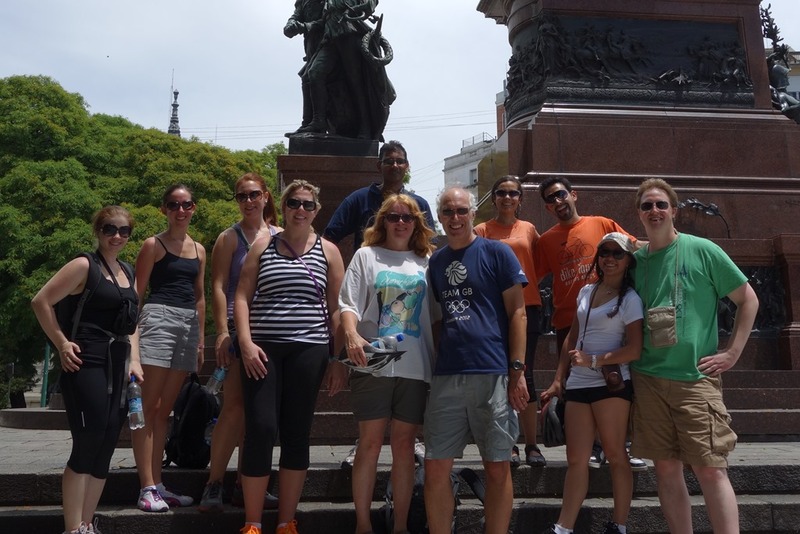 We enjoyed yesterday’s cycling so much that we signed up to do another tour today – this time heading north to the Recoleta and Palmero districts of the city. 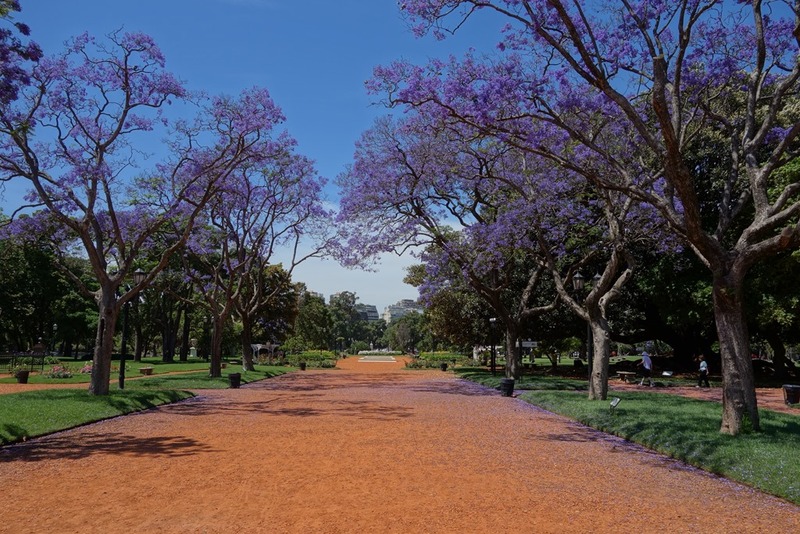 As we walk down to the meeting point for the cycle tour, it is immediately apparent that the city is much busier today and that yesterday’s strike was a rare opportunity to see a quiet Buenos Aires. As we head off, we get to a main road almost immediately and are very relieved to find that there is a marked out (and at times physically separated) cycle lane. It turns out that not only is the contrast with yesterday in terms of the business of the traffic, but also with the affluence of the districts visited. Not only are we heading off in the opposite direction to yesterday but the experience is also quite different with traffic running along one side of us and the railway line with the occasional train rumbling by on the other side. 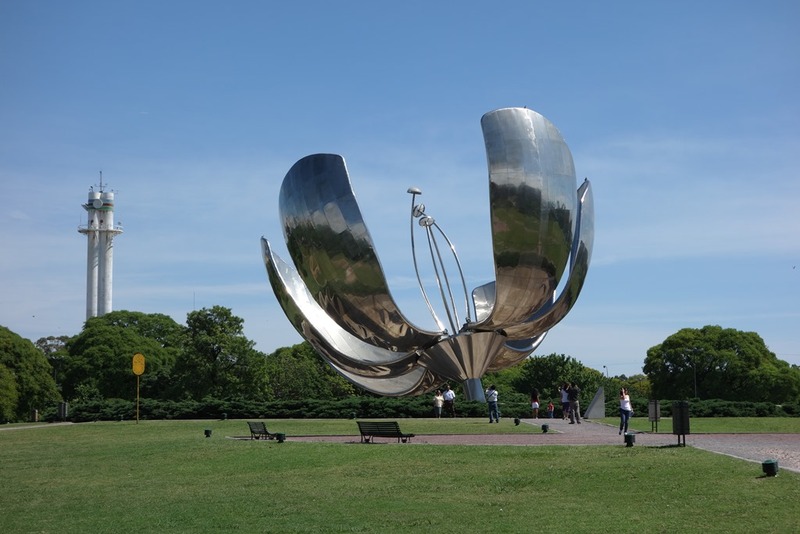 Our first stop is in the Plaza Naciones Unidas to see the Floralis Generica – a large metal statue in the shape of a flower. 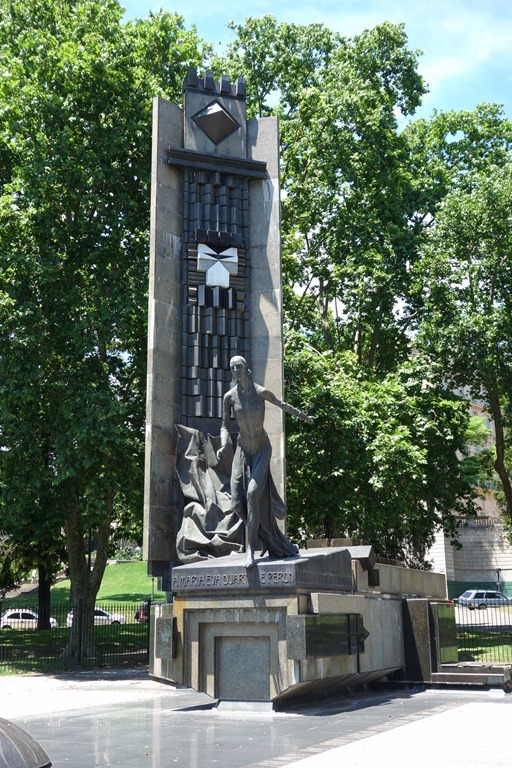 The statue is made of parts recycled from aeroplanes and apparently used to close at night like (some) real flowers do – however, the mechanism broke last year and hasn’t yet been fixed. It looks like roto is a key word for Argentinians too! After a taking a few photos, we head further on out of the centre passing through residential areas full of expensive looking houses and significant green areas. We pass (and are passed by) people out jogging, cycling, skateboarding and rollerblading and just generally enjoying the sunshine and warm weather. It really is a very pleasant temperature and environment. We then stop for a break in the Parque 3 de Febrero or El Rosedal (Rose Garden). Here there is not just a large rose garden but also a boating lake and plenty of locals exercising or lazing around. As it is a little way out of the centre of the city and, further, in a well to do part of town, I guess it is a bit more exclusive than (say) Hyde Park in London. No rest for us, though, and soon we are on our way again. 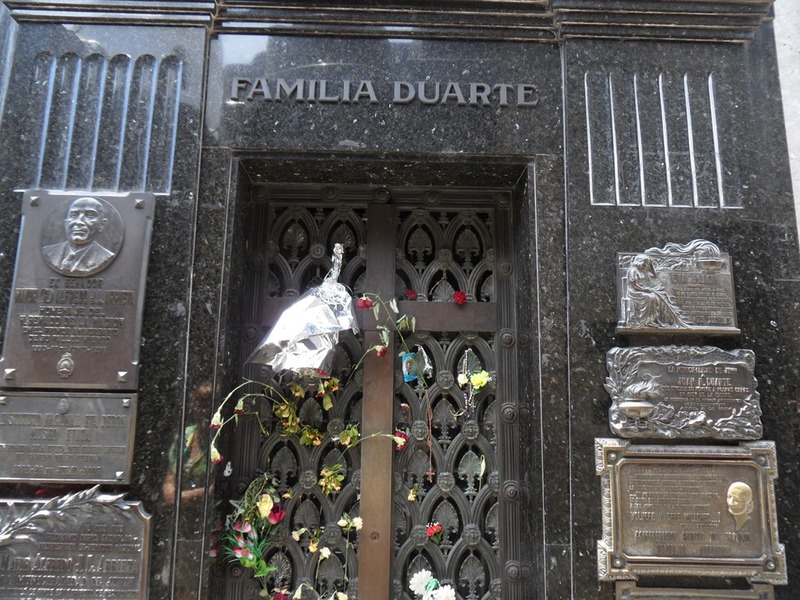 Next stop is the monument to Eva Peron (Evita) which is located in front of the house she used to live in (before the house was demolished in an act of pettiness by a later government). 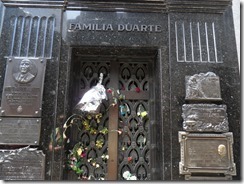 Then it is on to the Recoleta Cemetery where she is buried. 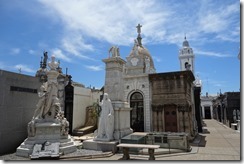 The cemetery is flagged as one of the must see attraction in all of the guidebooks but, even so, I wasn’t prepared for the sight. Forget about simple graves and simple tombstones. 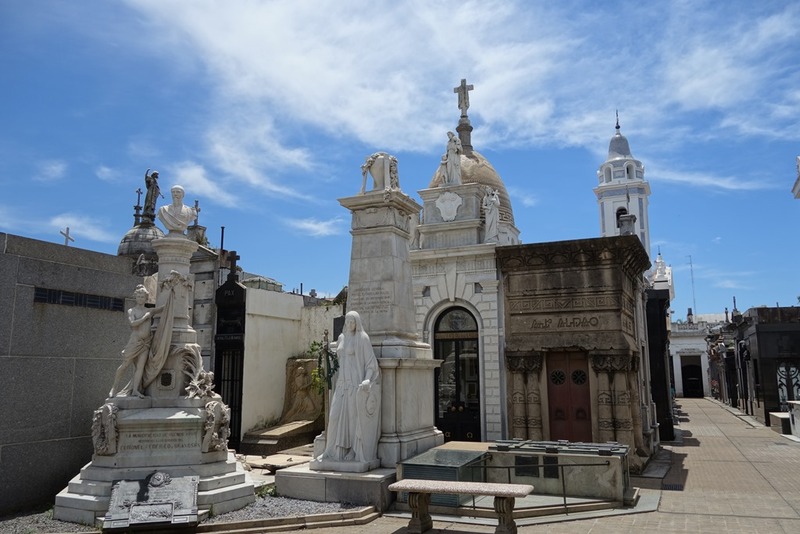 Here we have a competition by the rich and powerful families to have the most elaborate and ornate mausoleum for themselves and their families. There are 3 guides today as it is a larger group – around 10 of us – and with the extra traffic they are kept busy helping to marshal us and manage the traffic. Alex, one of the lead guides, starts to talk to us about Evita. Some of the story I knew from the musical and film (apparently, the first person to say ‘Don’t Cry for Me Argentina’ from the balcony of the Casa Rosada was Madonna in the film of Evita!). I had forgotten, however, that after her death, her body was stolen (raped and mutilated) and was only found 17 years later. Even more interesting though, was when Alex started talking about his own views on Evita, the various dictatorships that succeeded the Perons and the current government of Christina Fernandez de Kirchner. As an Economist reader, I was aware of their views on (for example) the discrepancy between official and real inflation rates. 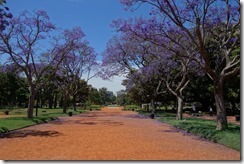 To have an ordinary Argentinian reflect these same views was really interesting. We have, so far, been to 9 countries on our trip, and I am developing a theory that wherever you are, people are just people and that it is governments that mess things up. 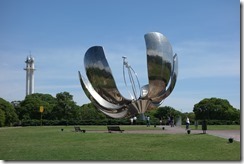 We had three priorities when we arrived in Argentina – sample a real Argentine steak; taste some of their wine and see some tango. We covered the first two off over the past two days and so tonight it was off to a Tango Show. We had seen a bit on the streets, and could have done more but after some deliberation (and canvassing friends on Facebook) we opted for a show. We chose the Carlos Gardel show but decided just to do the show and to skip the optional dinner. It was a bit of a tourist trap (for example, it supposedly included unlimited wine to drink, but Janet just about had to rugby tackle a waiter to get a refill). However, even if the service was appalling (and don’t get me going on the compulsory tip), the dancing was really good. I recorded a (small & illicit) sample on my camera and so you can see a snippet of the show below. 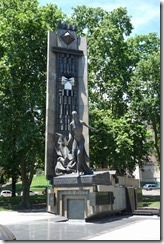 This entry was posted in Argentina, RTW Trip and tagged Argentina, Buenos Aires. Bookmark the permalink.